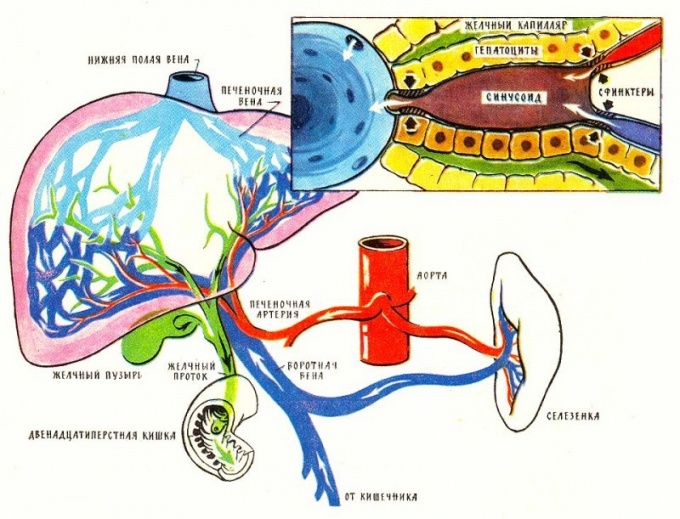 The liver is a unique organ that is involved in digestion, blood formation and metabolism. Its main function barrier, liver cells cleanse the blood of toxins. When there is pain in the liver, it can be caused by several factors. By themselves, liver cells do not have pain receptors. The pain is caused when the stretched capsule of the liver. It is common in acute and chronic inflammation (hepatitis), inflammation and stone formation in the gall bladder, as well as various tumors of the liver. If the liver is diseased, first you need to consult a gastroenterologist. The doctor will prescribe common blood test that helps to reveal inflammation. Indicators of detoxification function of the liver reflects liver function tests. If they are elevated, so is intoxication. The next step is to check for the presence of hepatitis. Their several varieties, each species have their own methods of determining. If blood tests revealed the presence of hepatitis (A,b,C,D or E), further treatment will be conducted by the doctor hepatologist. He will prescribe the detoxification, antibacterial or antiviral therapy, depending on the type of hepatitis. The second leading reason for liver pain is cholecystitis – inflammation of the gallbladder. There are acute and chronic. In the acute form the common symptom is jaundice, i.e., staining of the skin yellow. In chronic pain there are periods of exacerbation, i.e. after the intake of spicy, fried and fatty foods. The same signs are in the presence of stones in the gallbladder. However, if the stone is big in size, pain in the liver may be severe and paroxysmal. Such signs should be an ultrasound examination of the liver or a CT scan. Depending on the type and size of the stone treatment will be different. There are gallbladder stones that can be treated conservatively by a gastroenterologist. He will prescribed diet, medications and Dubai. If the stone to be removed, the surgeon will prescribe laparoscopic or abdominal surgery. Pain in the liver can be caused by the formation of its tissue tumors, cysts, or abscess. Such formations are usually well diagnosed on ultrasound. Ultrasound can pass on their own, without a doctor's prescription as a primary method of diagnosis. Special preparation before the test isn't required. It is best done on an empty stomach, and the day before to limit the intake of foods rich in fiber.